Aromatic oils have a huge number of useful properties, they are actively used in cosmetology and medicine. Essential oils have enjoyed special honor since time immemorial. One of the ancient admirers of aroma oils - queen Cleopatra was convinced that the beauty and youth of her skin she saved thanks to aromatherapy. One of the main advantages of essential oils is the ability to effectively fight cellulite. When applying aromamasel in the area of ​​problem areas, its active components warm up the skin, improve blood circulation as a result of stimulation of lymph currents. Oil against cellulite can be used for rubbing problem areas, for massage and baths. Anti-cellulite massage with essential oils warms up fat cells, speeds up metabolism, improves skin regeneration. As a result, cellulite is effectively eliminated, the skin is smoothed. lemon, orange, grapefruit oil, bergamot, geranium, muscat, cinnamon, rosemary, cypress, juniper, fennel, lavender. These oils can be added to the anti-cellulite cream in order to enhance its effect. An excellent tool in the fight against cellulite in the home is massage with essential oils. To obtain effective results, massage should be done twice a day. This procedure is not just useful, but also very enjoyable, as well as a therapeutic anti-cellulite effect you are immersed in an aromatherapy session. Many essential oils have an anti-cellulite effect. 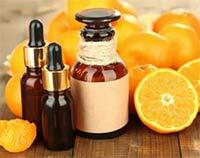 For a massage, you can take any one oil, for example, special popularity has acquired orange oil against cellulite. But it is better to prepare a mixture of aromamasel against cellulite. To get an effective massage oil from essential oils, you need to take the base oil (it can be any vegetable oil, but better - almond oil), and dissolve in it 3-5 drops of several aroma oils with anti-cellulite effect. Ingredients: 5 teaspoons base oil, grapefruit oil and bergamot - 10 drops, geranium oil - 8 drops, muscat and cinnamon oil - 3-4 drops. If you want to change the amount of ingredients in the recipe, then remember that each of the aroma oils should be mixed with one teaspoonful of base oil. How to do an anti-cellulite massage with essential oils? Apply the prepared massage oil to the skin area with cellulite and massage the skin for 15 minutes. It is not necessary to wash off the oil from the skin, it is enough to get soaked with paper towels. Almond oil is an optimal component for the basis of massage oil against cellulite. It completely dissolves in itself any aromatic oils, besides it has a gentle unobtrusive aroma, which allows it to be used as a basis for any aromatherapy. Almond oil has a rejuvenating effect, as it accelerates the process of tissue regeneration, nourishes the skin, smoothes and makes it supple. Essential oils are very useful to add to the bath. 5-10 drops of essential oil should be diluted in cream and added to warm water. Oil is also often applied to a handful of sea salt, and then dissolve it in water. This procedure helps improve the blood circulation of the skin and eliminate cellulite tubercles. The bath is taken 15-20 minutes 2-3 times a week by a common course - 15 procedures.